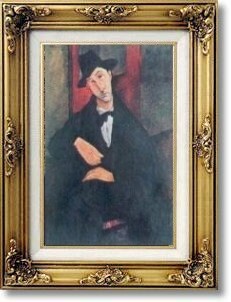 Portrait de Mario by Modigliani - no-risk guarantee! Amedeo Modigliani was born in Livorno in July 1884 into a family of Sephardic Jews. He was the bohemian artist par excellence - his posthumous legend is almost as famous as Van Gogh's. In style terms he was an oddity: contemporary with the Cubists, but not part of their movement, he forms a bridge between the generation of Toulouse-Lautrec and the Art Deco painters of the 1920s.